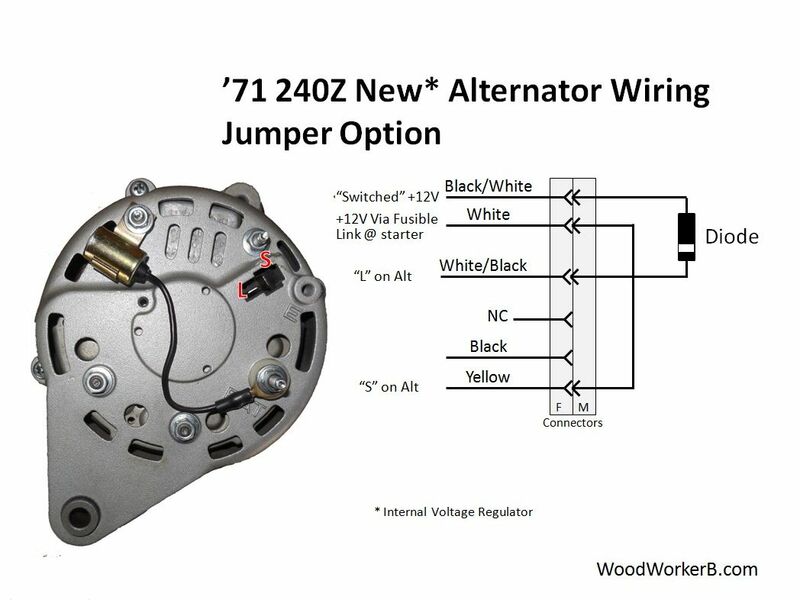 Consider replacing your old stock alternator and external (mechanical) voltage regulator with a newer, higher capacity, solid-state internal voltage regulator alternator. 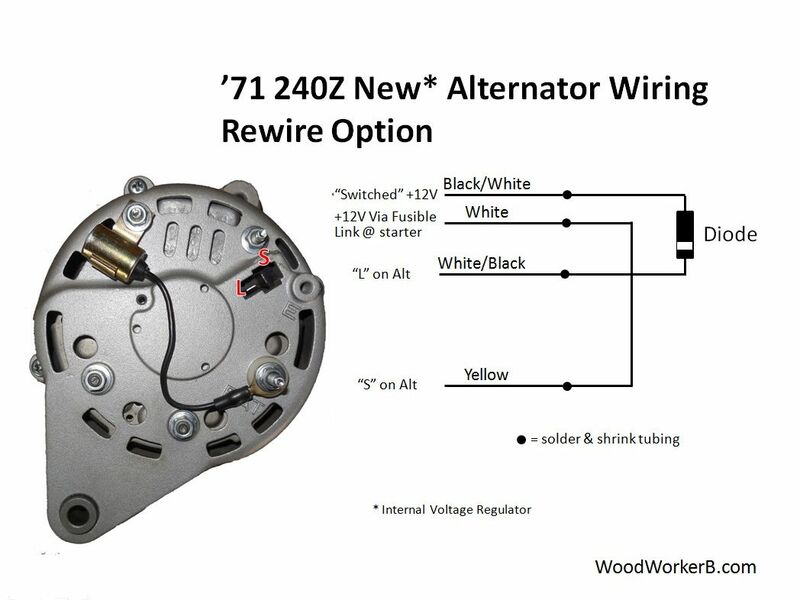 The alternator upgrade is easy, with a couple of options for the wiring. I had my old, stock alternator finally shot craps at 80 mph in the fast lane of a Southern California freeway. For whatever reason (H4 headlights? 400 Watt amplifier? Seat heaters?) it went to a dead-short to ground, blew the fusible link, and that’s all she wrote. 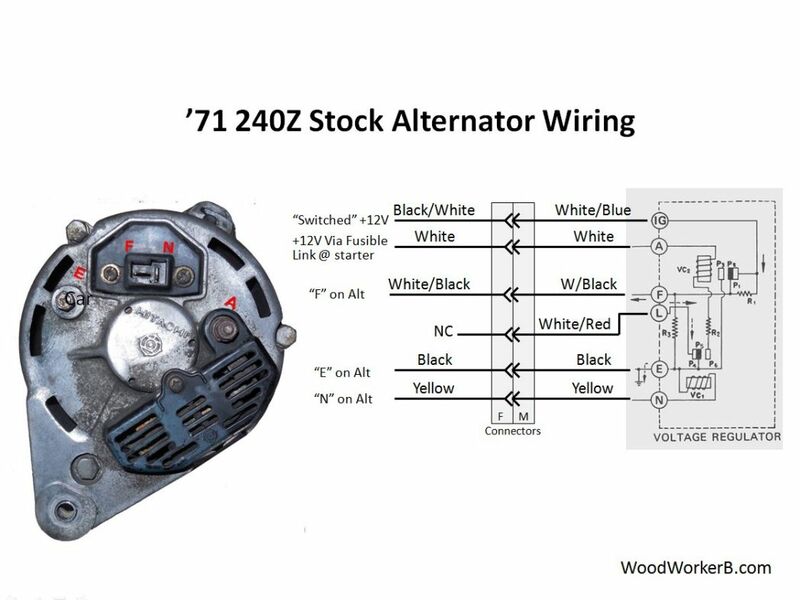 For reference, here is the stock alternator that uses the external mechanical voltage regulator. FWIW, I kept the old voltage regulator in place, and just tucked the wiring into the main harness, so it looks like it’s still ‘in the circuit’. I had the ‘New’ alternator tested (O’Reilly Auto Parts) before I took the time to bead blast the casing. Unfortunately, I no longer have a record of the manufacturer or model number. Figure 2. New (left) and old (right) alternators. Here are three wiring diagrams. First is the stock wiring, with the mechanical voltage regulator for reference. Second is the approach that uses a jumper in place of the mechanical voltage regulator. 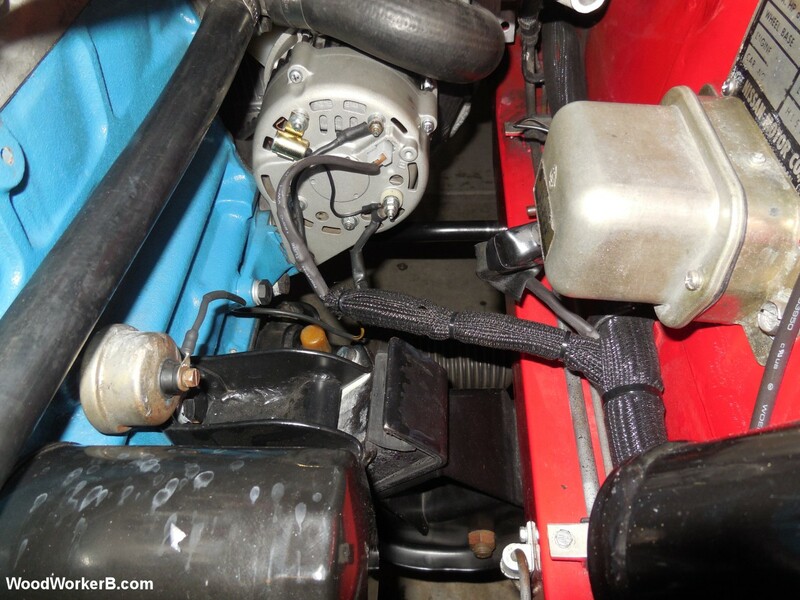 Third is what I did, a modification to the wiring harness. The “S” terminal is the “Sense” input. This connects to the battery and measures the voltage – the voltage regulator will do what is necessary to keep the alternator output such that the voltage at the Sense input is between 13.8 and 14.7 Volts with the motor running. With the motor off, a fully charged automotive battery should measure at 12.6 volts or above. Figs 6 & 7 show the placement of the diode in the “L” circuit. Some references claim the care will keep running if this diode is not in place. I decided to add it – figured better safe-than-sorry. Since the environment in an engine compartment is so hostile, I opted to crimp-and-solder both ends of the diode into the cable. Notice the white stripe on one end of the diode. It is important this is on the side of the diode facing the alternator. Fig 8 shows the details of the different colors connected to each other as well as the diode. 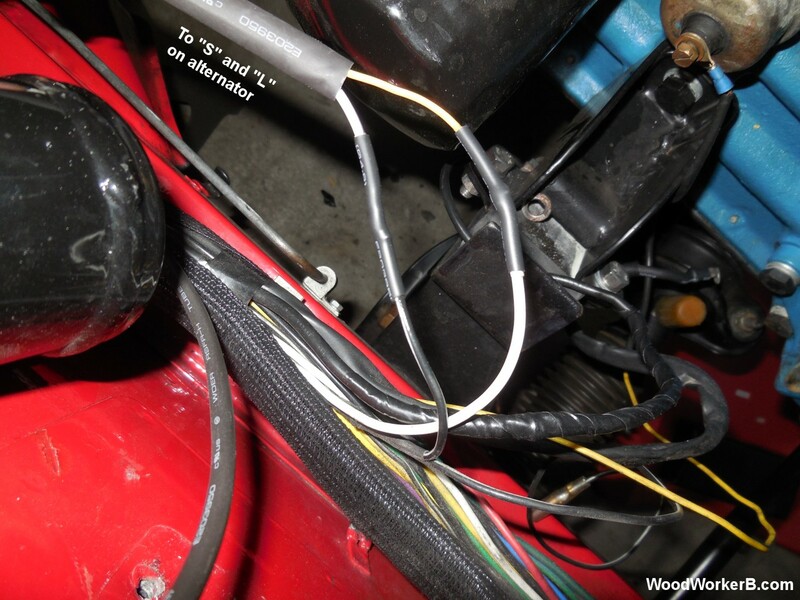 Fig 9 shows the wiring just before closing-up into the wiring loom. The “S” and “L” wires are placed inside another length of shrink tubing. Here is the final shot of the completed install (Fig 10). Notice I kept the old mechanical voltage regulator in place to maintain a more ‘stock look’, although the wiring is not connected at all, I just tucked the ends of the old wiring into the wiring loom. Fig 8. A detail view of the modified “S” and “L” connector wiring harness (click for larger image). Fig 9. The solder-and-shrink-tubing before re-installation back into the wiring loom (click for larger image). Fig 10. 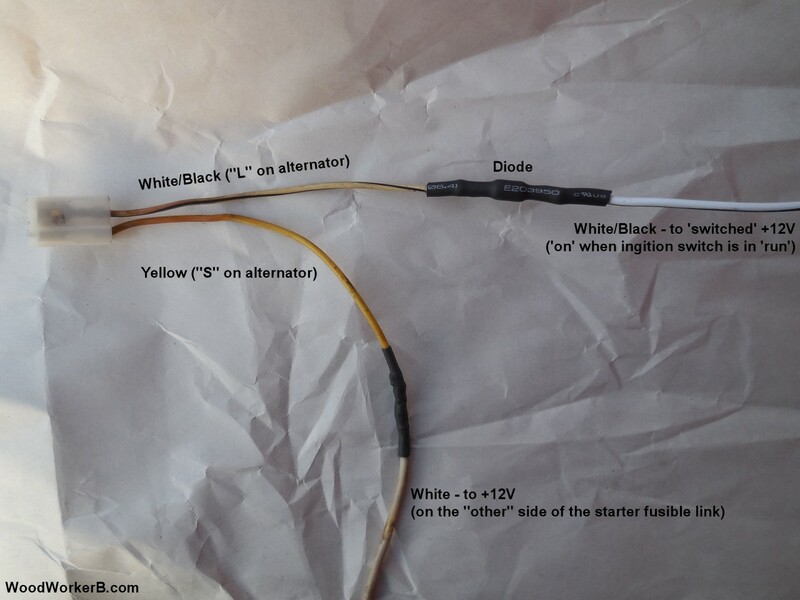 Finished wiring loom to alternator (click for larger image). When the old alternator crapped-out, I had to get a tow. I got this cool photo of the shadow of my 240Z on the flat-bed tow truck when we stopped at a light.